The 5200 version of Pac-Man was quite amazing at the time when it came out in late 1982 (compared to the rotten VCS version). It was even better than the 400/800 version that was released a few months earlier (which lacked intermissions and proper monster AI). But the first time I played 5200 Ms. Pac-Man, it was apparent that although it looked better (esp from screenshots), it didn't run nearly as smooth as Pac-Man. The mazes were also smaller, having all this wasted screen space around them. On top of that, it flickered like crazy! In fact, it shows the same flickering issues that VCS Ms. Pac-Man had, due to the use of vertical separation and variable flicker. However, neither of those techniques were required for the 8-bit hardware since that allowed for up to 4 independent sprites (called "player/missile graphics"), instead of the 2 the VCS hardware offered. And the 4 missiles can be combined to basically make another 'sprite', giving you 5. Just look at the 1st Ms. Pac-Man intermission - you have 2 Pac-Man characters and 2 monsters, and when all 4 are on the same horizontal 'line' at the end, the 2 monsters alternately flicker - you can't even get a screenshot of them both at that point, and there's only FOUR objects on the screen! Rather shocking to see just how poorly this version was implemented, being it's basically GCC's flagship title, and considering just how amazing the VCS version is. Aren't the "player" sprites one color though? So to get white eyes or a red bow, you'd have to combine two player objects into one? Pac Man didn't have that level of detail. 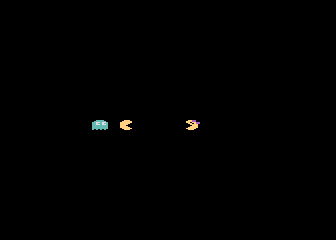 The ghosts had transparent eyes (no whites), and Pac Man was just one color. So the 5 players were fine for that game. My best guess would be that for Ms. Pac Man, they used the "missile"s to make the eye whites and red bow. That left them one player short and hence flicker. The smaller screens were done that way to try to keep a similar aspect ratio to the arcade's vertical screens. If you look at how Pac-Man on the 5200/8-bits looked wider than the arcade then you can see what Atari was trying to do with Ms. Pac-Man as far as mazes are concerned. As for the sluggish game play on said machines, and from a programmer perspective, the early levels appear to be slowed down by a delay timer. In later levels the game picks up speed to where the sluggish game play is not as noticeable. As for the flickering...both 5200/8-bits have identical processors designed with gaming in mind. Today there is a ton of information on those systems and how to develop for them but when they first came out it was new technology that took a while to learn. They were a step up from the 2600 we all know. Ms. Pac-Man on those systems, while not 100% glitch free, is an OK game. It could have been much worse. As good as they look on those systems they are also good examples of what to avoid doing on those systems. And it is for those reasons why I say the best home version of Ms. Pac-Man ever created is on the 7800. That one shows what was learned from past efforts. 7800 version is indeed much better. But it's due to the hardware itself. MARIA chip in the 7800 allowed unlimited sprites. You won't ever see flicker in a 7800 game due to that. Atari 8-bit was limited to 4 player (8 pixels wide) and 4 missile (2 pixels wide) graphics as mentioned above. If it wasn't for the TIA sounds I still believe that the 7800 could have out performed the NES without breaking a sweat. The ability to move over 100 sprites on the screen at the same time was amazing for its time. And it is something that really has not been duplicated again to my knowledge. If the same games on the NES made it to the 7800 I believe the 7800 would have won in the graphics department. Sounds...that is another story but we did have the options to include POKEY on the carts. That and the lack of any collision detection circuitry. That had to be done by software. RickR: You're right. The PM graphics are only 1-color. That explains why Atari's Pac-Man opted not to fill in the eyes; doing so avoided the flickering problems that plague Ms. Pac-Man. As for trying to reproduce the arcade's screen ratio, the home version has black space around all 4 sides. If that's what programmer Steven Szymanski was trying to accomplish, there wouldn't have been space on the top and bottom (the maze is still in a horizontal layout). As for delays being intentionally programmed in, I don't know, but I know nothing seems to move across the screen without split-second pausing. Nothing seems to move smoothly. I'd sooner chalk it up to being Symanski's first effort on that hardware and not being experienced enough with it to do a better job (or just being the wrong guy for the job, much like Tod Frye was with Pac-Man). GCC seemed to knock it out of the park with the VCS version (that and Vanguard were their first 2 VCS games). And yes, the 7800 is a smoking faithful version, probably the best arcade conversion on that system. Rick- the 7800's Maria chip certainly doesn't allow an unlimited number of sprites. I remember the number being touted BITD to be 100. Regarding the 7800 being on par with the NES (other than the sound), the 7800 wasn't designed for games with detailed backgrounds; it was designed to move a lot of objects on the screen w/o flicker (Asteroids, Robotron, Joust, etc). Atari had their chance with the 7800 and basically sat on it for 2 years. When they decided to get back into the market, they didn't have anything new, so they "un-mothballed" the 7800 and redesigned the VCS and 800 hardware again. Atari also had the chance to release the NES in the U.S. and fumbled that away, too. Rick- the 7800's Maria chip certainly doesn't allow an unlimited number of sprites. I remember the number being touted BITD to be 100. Whoops! My bad. 100 may as well be unlimited to me after being stuck with only 4/4 on the Atari 8-bit. It's still an incredible number. After listening to the guys from GCC talk about their plans for the 7800, there is no doubt that Atari dropped the ball. The system was really meant for so much more and it would have been a better contender against the NES had things been pursued. The expansion slot would have allowed for several improvements too. 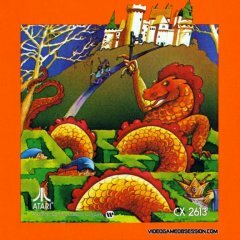 The maze collision routine would have to be completely re-written, as it doesn't work the way the arcade (or 7800 version for that matter) work. I'm not proficient enough in the 5200 to be able to do that. When I did Hangly Man on the 5200 I had to make changes to the maze layout to fit in the framework of how the maze collision worked there. Take most of the code from the 7800 version, rip the 5200 graphics, and then mix 'em!! VIOLA! Yea...if only it were that simple. I've been trying to learn the 5200 but I am also still learning Assembly and have not completely understood the A8/5200's DL yet...from scratch anyways. 6502 is an interesting processor. Oh man...Blaster Master on the 7800 would be really cool to see. I could do assembly on the 8-bit back in the day, and it was quite interesting. Not sure I'd want to go back to that. 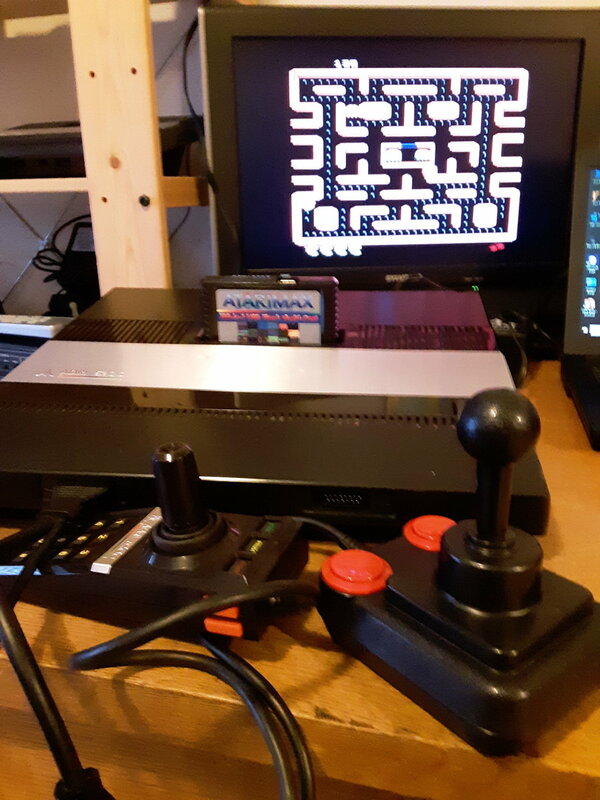 I still find 5200's Ms. Pac-Man a good investment for the misunderstood system. Like other 5200 games it is a game that doesn't forgive for player errors easily. I like it better than the original Pac-Man game. Jr and Super Pac-Man should have been released on the system. They were finished and ready! And those two really showcase what the 5200 was truly capable of. Personally, I have liked every version of Ms. Pac-Man on the Atari systems despite their not being perfect. They replicate the gameplay very well. As for Jr. Pac-Man and Super Pac-Man, I have those for the 5200 and both are nicely done. It is unfortunate, Atari did not release them during the console's lifetime. I'll definitely give Ms. Pac Man a go when I get my 5200 out for the Centipede challenge. I don't remember it being "bad". But perceptions change over time I think. I don't think it's bad. I've had plenty of fun playing it. I just now played Ms. Pac Man on a 5200. It's a great game. Yes, there is flicker. But it's not bad. The ghosts have white eyes with a blue pupil, and I think that explains the flicker. The movement is a little choppy at first. Kind of like Jr. Pac Man on the 2600 and 8-bit, they seem to introduce the choppiness to slow down the game on the early levels. Once you get up to level 5 or so, everything flies around with no choppiness at all. I'm going to say this version of the game is superb. A+. It's fun, and I really had a good time playing it. Agreed. Like I said, I've had plenty of fun playing it.